It succeeded the American House hotel, which burned to the ground in 1861. The American House opened its door in 1843, three years before this city was incorporated, on the site of the present Plankinton Arcade. It was the second hotel in the city according to the voluminous 1881 History of Milwaukee. 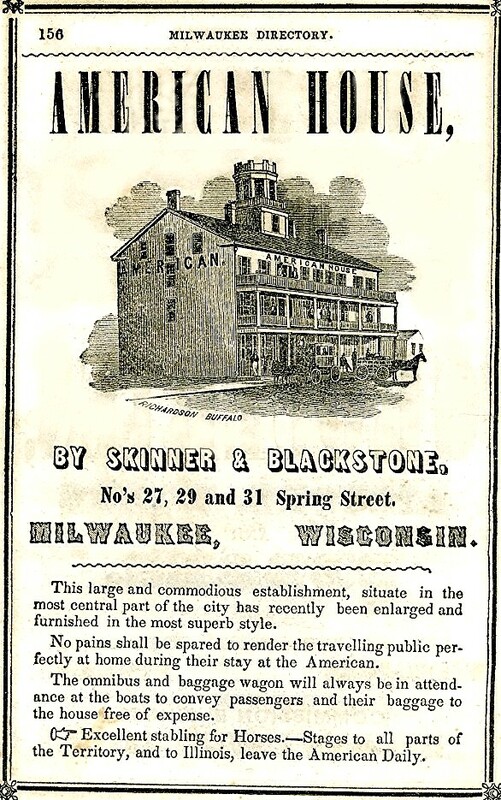 The first illustration is an engraving featured as a full-page ad in the 1848 Milwaukee City Directory, which was the second city directory, the first having been published in 1847. (Note the typos in the ad, with the misspelling “traveling” and “situate” rather than situated.) The hotel was a simple wooden structure in the style so popular for hotels at that time. It was conveniently located on the Kilbourn side of the river and had easy access to the first stage road to Chicago. The first railroad would not arrive until 1851, but it was also conveniently located to this hotel. But, as happened to nearly all of Milwaukee’s early hotels, it would burn in a fire on the 4th of July, 1861. As we wrote recently, a later and more famed hotel, the Newhall House, was also burned to the ground, in 1883. It had been built in 1857. The city’s next major hotel would be the Plankinton House, built in 1867 and located on the site of the old American House. The site had attracted the eye of John Plankinton who would erect the Plankinton House. Plankinton, at the time, was a prosperous meat packer in a partnership with Phillip Armour. The partnership would break up and Armour would find his fortune in Chicago, while Plankinton became a leading citizen of Milwaukee. 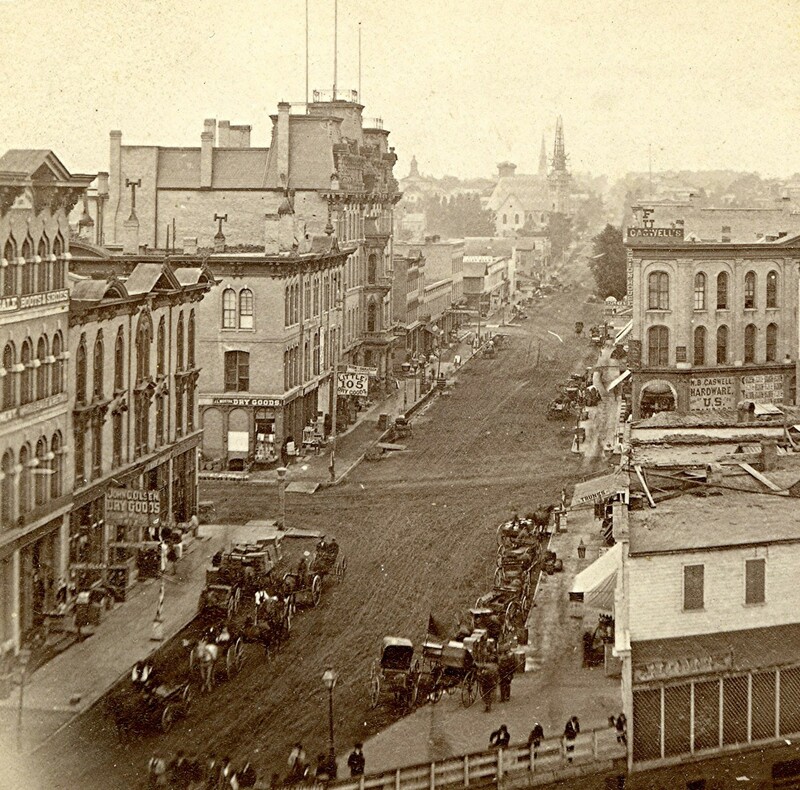 The second image (below) is a view (c. 1869) of Spring St (now Wisconsin Ave.) looking west from the Milwaukee River. The Plankinton Hotel is the tallest structure with the mansard roof. The neighboring buildings are all quite modest. The frame structures, in the right foreground, are the site of the present-day Riverside Theater and the Cream City brick buildings to the left are the site of what became Gimbel’s. Plankinton’s hotel site would prove a good one, especially as the transportation infrastructure would markedly improve in the following decades, with streetcars running down this avenue. The Plankinton remained one of the city’s foremost hotels for decades. The American House is strongly reminiscent of the Old Wade House, which still stands south of Highway 23 near Plymouth. I love the 1869 view, as I can perfectly superimpose the current view over it in my mind. The men leaning on the fence overlooking the river catch my attention, as I try to picture what kind of boat traffic they might be looking at. Thanks for sharing your collection, Jeff.